Camel Bags, Saddle bags and Pillows. We are proud to present Australia's largest collection of genuine Anatolian camel bags and sitting pillows. The Anatolian nomads used large camel bags for transporting and storing their life belongings. Strong, bold geometric symbols and colourings show us the area from which the groups came. These bags are another remarkable reminder of how creative art and functionality combine in the Anatolian culture. 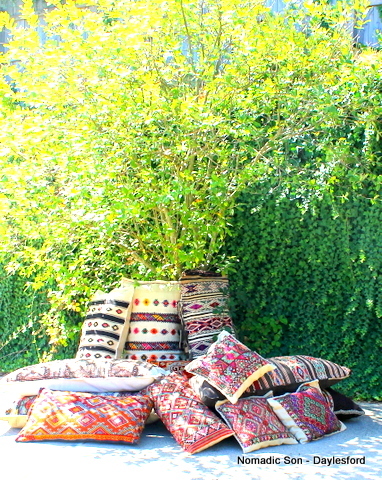 Ala Çuval: Decorated sacks were used by the Anatolian nomads at times when they were completely nomadic. These sacks/bags were highly decorative either when lined up along the inside of the tents or, attached to their camels when making the seasonal migrations across Turkey. Even after some nomads stopped using camels as their mode of choice, a young girl was still required to weave one or two camel bags for her dowry. Sadly today, this tradition has virtually ceased. When some of the Anatolian nomads started to settle in villages, usually at one of their migrational camp areas, their houses still resembled the one-room tents reminiscent of their recent past. Ever adaptable, the women started weaving oturma çuvallar (sitting sacks) which are generally narrower and longer than a camel bag or grain sack. These would still line up along the side of their home, beautifully decorating their interior. As they will in your home today, decades later.